Royal Stewart Arms is a 55+ community in Dunedin, Florida. This waterfront neighborhood features eight condo buildings with a total of 449 units. Homeowners enjoy a rich lineup of indoor and outdoor amenities at the clubhouse where they can stay physically fit and social throughout the year. Residents also enjoy the beautiful landscapes as well as majestic views of the Gulf of Mexico and the Intracoastal Waterway. Located on Honeymoon Island, active adults are surrounded by wildlife, nature, and outdoor recreation. Honeymoon Island State Recreation Area and Pinellas County State Aquatic Preserve are just outside of the community's entrance. Sandy beaches are plentiful in the area as well, making this vibrant age-restricted neighborhood an island paradise for active adults in the Tampa Bay area. The central hub of physical activity and social engagement happen at the well-appointed clubhouse. The clubhouse features areas where neighbors come together and share similar interests or hobbies. An exercise room is useful for staying in shape without having to travel far from home. The recreation hall and party room are multi-purpose areas that can be used for parties, classes, demonstrations, and events like bingo, dances, or movie night. The card and billiards rooms are perfect for a casual game night. Book worms can catch up on the latest novel in the library. A catering kitchen is also on hand for preparing a snack for a club meeting. Outdoor amenities are sure to please residents as well. The heated outdoor pool and patio, which face the gulf coast, are great for a refreshing swim or relaxing under the Florida sunshine while enjoying scenic water views. Neighbors can challenge each other to a friendly game of shuffleboard, tennis, or horseshoes. There are picnic and BBQ areas throughout the community where you can host your next feast. Residents can take advantage of the private fishing pier and catch trout or flounder to take home for a fish fry. Homeowners will also love the walking and biking trails that surround the community as well as the park spaces for enjoying the tropical environment. This 55+ neighborhood was developed between 1968 and 1975. It consists of eight condo buildings with a total of 449 units, which are available on a resale-only basis. Active adult homebuyers can choose from a variety of units that offer approximately 539 to 1,420 square feet of living space with one or two bedrooms, one or two bathrooms, and carport parking. Each condo building has elevator access, laundry facilities, private patios or balconies, and plenty of storage space. Most units enjoy scenic water views as well. An affordable homeowners' association (HOA) fee includes exterior maintenance, trash pickup, cable, water, and heat. Thanks to the HOA for handling tedious exterior home chores, residents in this age-restricted community will have more leisure time and never become bored. There are plenty of options for homeowners to socialize and share similar interests with others. They can take a yoga or exercise class to stay healthy, or hang out at the clubhouse for movie nights, group dinners, and dances. Active adults can easily make new friends by participating in activities like bingo, cards, shuffleboard, tennis, or horseshoes. Neighbors can go fishing at the pier, take a nature walk, or rent a kayak to take around St. Joseph's Sound. This caring and welcoming neighborhood is sure to offer something for everyone to enjoy. Ideally situated on Honeymoon Island in Dunedin, FL, residents live in a serene and tropical paradise with plenty of outdoor recreation, scenic water views, daily conveniences, and attractions. Homeowners can take a drive on Causeway Boulevard to get to the Causeway Plaza for some shopping. There is also a Publix, marina, bait and tackle shop, and a variety of restaurants nearby. Outdoor enthusiasts will love being near Honeymoon Island State Park where they can look for shells along the beach or go swimming, fishing, and hiking. Caladesi Island State Park is just 30 minutes away and offers more sandy beaches and water activities. For quick day trips, residents can visit Clearwater that's 20 minutes away or St. Petersburg or Tampa, which are about 45 minutes away. When traveling farther is necessary, homeowners have access to two airports: St. Petersburg-Clearwater International Airport and Tampa International Airport. 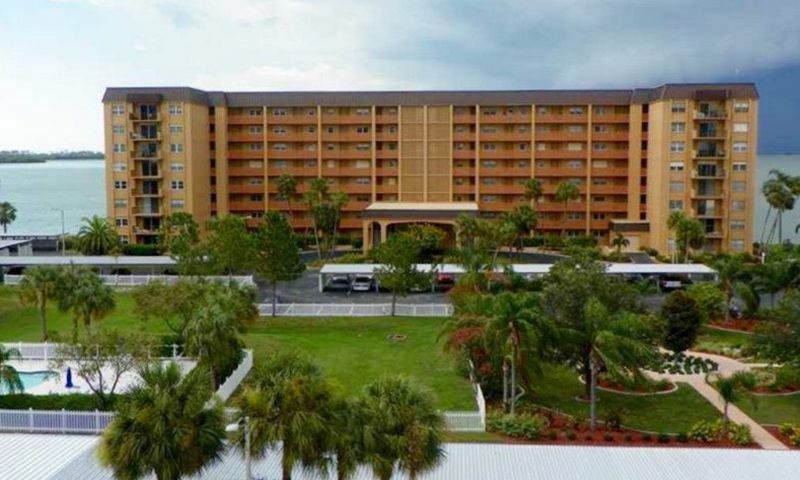 Active adults will love the prime island-like location and great amenities in this 55+ community in Pinellas County, Florida. There are plenty of activities available in Royal Stewart Arms. Here is a sample of some of the clubs, activities and classes offered here. Royal Stewart Arms consists of eight condo buildings with a total of 449 units. Active adult homebuyers can choose from a variety of units that offer approximately 539 to 1,420 square feet of living space with one or two bedrooms, one or two bathrooms, and carport parking. Each condo building offers elevators, laundry facilities, private patios or balconies, and plenty of storage space. Most units enjoy scenic water views as well. Please Note: Floor plans are not available at this time. Many seniors refuse to pick up after their animals. Previously one lady didn't want anyone to know she had a cat.....what wrong did she do??? Dump the litter box down the toilet!!!! Let's just say pipes like concrete???? We have also found that as Seniors get older, it's harder for them to take the dog out and to keep the dog under control. These are not service dogs that obey. Great location, great views but no pets allowed. When will some of these 55+ communities recognize that pets keep seniors younger for longer? If they truly care for their residents they would encourage pets. 55places.com is not affiliated with the developer(s) or homeowners association of Royal Stewart Arms. The information you submit is distributed to a 55places.com Partner Agent, who is a licensed real estate agent. The information regarding Royal Stewart Arms has not been verified or approved by the developer or homeowners association. Please verify all information prior to purchasing. 55places.com is not responsible for any errors regarding the information displayed on this website.